Governor John Bel Edwards addressed lawmakers at the start of the 2019 legislative session, which began Monday, April 8th. 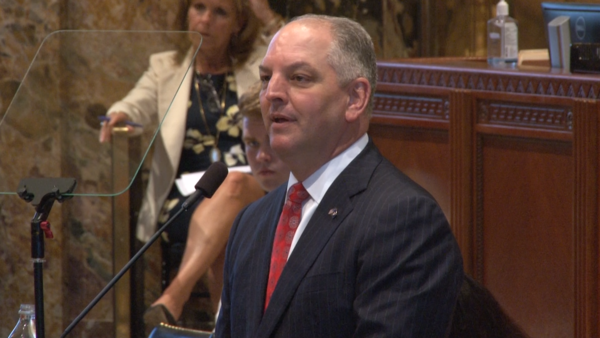 Governor John Bel Edwards marked the beginning of the 2019 legislative session Monday addressing members of Louisiana’s House and Senate. Before laying out his priorities for the session, Governor Edwards pointed out there’s one thing the Legislature won’t be discussing. "You won’t hear me talk about a fiscal cliff today," he told lawmakers. After years of special sessions where budget deficits were the central focus, the state’s finances have stabilized. And while the Governor and Legislature were able to corral support to end the budget crisis last year, Edwards continues searching for enough votes to pass equal pay legislation and an increase to the state’s minimum wage. "Every year, I stand here and make the case for why we should increase the minimum wage and pass equal pay legislation," he said. "And every year that goes by, we fall further and further behind." Edwards is backing a plan to increase the minimum wage from $7.25 an hour to $9 an hour, on par with states like Arkansas and Missouri. He’s pushed similar attempts over the past three years at slightly lower rates, but the Legislature has consistently opposed the move. For the first time, the Governor is asking lawmakers to put the proposal to a vote of the people. Meanwhile, the Governor’s top priority - a teacher pay raise - is gaining traction with lawmakers. "I want to bring our teacher pay up to speed with other southern regional states starting with a $1,000 pay raise this year," said Edwards. "This would be the first step in a multi-year process." Average teacher pay in Louisiana is just shy of $50,000. The pay raises have gained bipartisan support leading up to session, a hard thing to come by in an election year like this one. Edwards is running for a second term in 2019. Sitting behind the Governor as he addressed the Legislature was his opponent in the race, Republican Congressman Ralph Abraham. Copyright 2019 89.3 WRKF Baton Rouge. To see more, visit 89.3 WRKF Baton Rouge.